This white paper describes Dell’s SC4020 All Flash MEDITECH solution powered by Intel® Xeon® processors. It is the combination of fully integrated and tested components, software and MEDITECH services—a complete solution for hospitals. 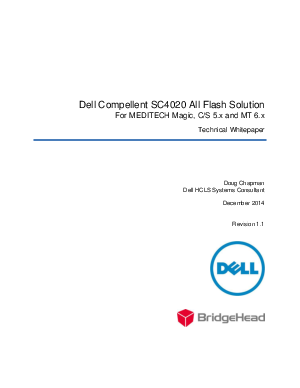 It is the results of years of extensive collaboration between Dell, BridgeHead software and MEDITECH and is consistent with Dell’s philosophy of “Open, Capable and Affordable”. Dell is pleased to offer hospitals this contemporary MEDITECH solution that addresses the drawbacks and limitations that are associated with traditional legacy storage solutions.